Carex morrowii ‘Ice Dance’, a sedge (rather than a grass). 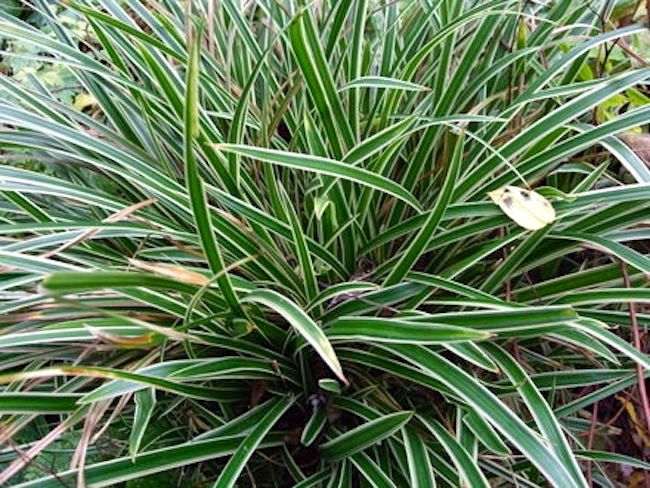 ‘Ice Dance’ is a dense, spreading sedge grown for its foliage. This sedge looks good year round, even in winter.The early-spring flowers are insignificant, but the white-edged leaves complement most other plants. Grow as a groundcover in woodland areas or in a shade garden. This sedge is evergreen in warm climates. Carex is a vast genus of almost 2,000 species of grassy plants in the family Cyperaceae, commonly known as sedges (or seg, in older books). Other members of the Cyperaceae family are also called sedges, however those of genus Carex may be called “true” sedges, and it is the most species-rich genus in the family. The study of Carex is known as caricology. Carex morrowii, commonly known as Japanese sedge or Morrow’s sedge … The genus name from Latin means ‘cutter’, in reference to the sharp leaves and stem edges [The common name sedge, from Old English, has the same origin] … The specific epithet honors Dr. James Morrow, who collected this plant in Japan as a member of the U. S. Expedition led by Commodore Perry in 1853-1854. Cyperus rotundus is one of the most invasive weeds known, having spread out to a worldwide distribution in tropical and temperate regions. It has been called “the world’s worst weed” as it is known as a weed in over 90 countries, and infests over 50 crops worldwide. In the United States it occurs from Florida north to New York and Minnesota and west to California and most of the states in between. … Its existence in a field significantly reduces crop yield, both because it is a tough competitor for ground resources, and because it is allelopathic, the roots releasing substances harmful to other plants. It was a serious pest plant in our Columbus OH garden. Final note, on the expression true sedge as used by botanists. Another instance of taking an ordinary-language name N — in this case, sedge — and applying it to a relatively small taxonomic category which is then identified as the category of true Ns. According to this way of talking, Japanese sedges (in the genus Carex) are true sedges, but nutsedges and other members of the genus Cyperus (including the papyrus sedges, the umbrella-sedges, and the flatsedges) are not (despite the fact that this genus is the type genus for the family Cyperaceae, or sedge family). I’ve never understood the appeal of this nomenclatural move: why not just refer to the genus Carex? This entry was posted on September 26, 2017 at 7:23 pm and is filed under Language and plants, Names, Technical and ordinary language. You can follow any responses to this entry through the RSS 2.0 feed. You can leave a response, or trackback from your own site.